How to back up and restore iPhone without iTunes? Home » How to back up and restore iPhone without iTunes? 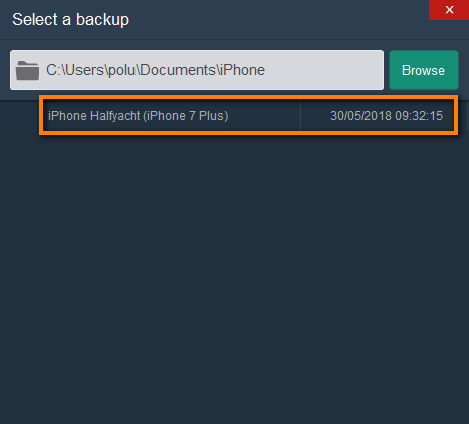 This tutorial demonstrates a user-friendly method to make full-featured iPhone backup and restore on your computer without iTunes. Backups include app documents, preferences, contacts, calendars, messages, and more. 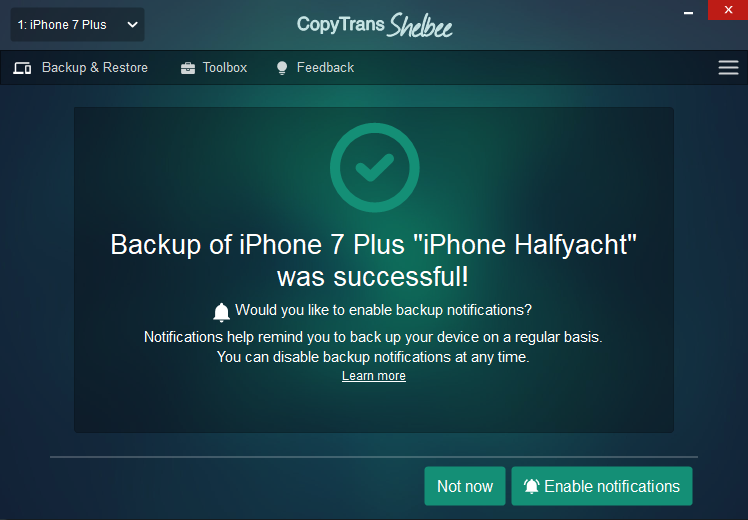 The method involves using CopyTrans Shelbee which is compatible with all iOS devices including the iPhone Xs and all iOS versions including iOS 12. Install the program. If you need help installing CopyTrans Shelbee, please refer to the Installation guide. Run the program and connect the iPhone or iPad to your PC. Click the “Backup” button. Select the PC location where to backup the iPhone by clicking the green pencil button on the right. By default this is the same location where iTunes keeps iPhone backups on your computer. When you are ready to begin the backup, click “Start”. Wait until the backup is complete. 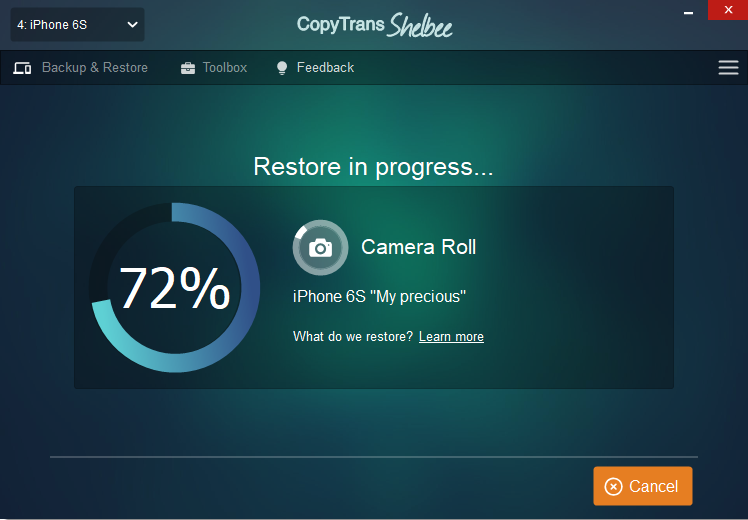 CopyTrans Shelbee backs up iPhone settings, contacts, calendars, messages, app documents, and photos/videos in the Camera Roll. Encrypted backups also contain passwords for email accounts, Wi-Fi and websites. NOTE : backup includes all data contained in regular iOS backups and more. After the backup completes successfully, you can enable backup notifications to never miss the time for the next backup. The iOS backup is saved at the PC location of your choice. – Apps: starting with iOS 9, app backup is no longer possible due to Apple restrictions. App data is still included in the backup. For more details refer to What you need to know about iOS 9 and the backup of iPhone apps. 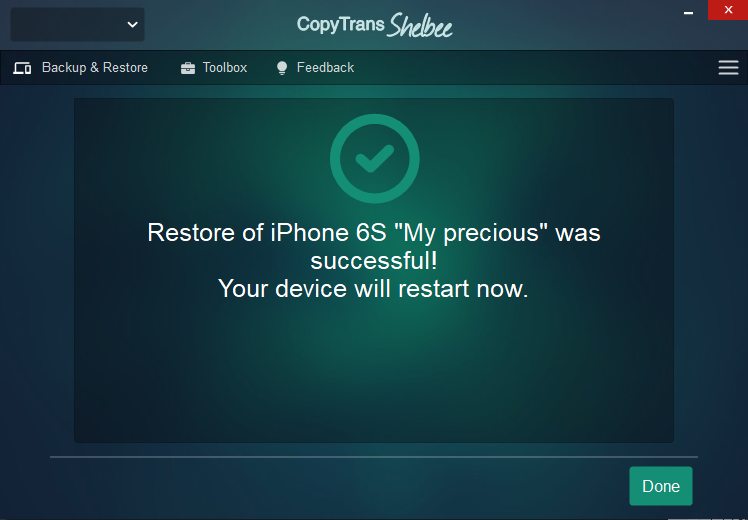 To restore the iPhone from backup to the same or to a new iPhone, iPad or iPod Touch, run CopyTrans Shelbee and connect the iOS device. Click the green pencil button on the right to select the backup to restore. From the newly-opened window select backup entry that you wish to restore from. If you made multiple backups, you will see the backup entries listed. Wait until the restore process completes. That’s it. You restored your iPhone from backup without iTunes! 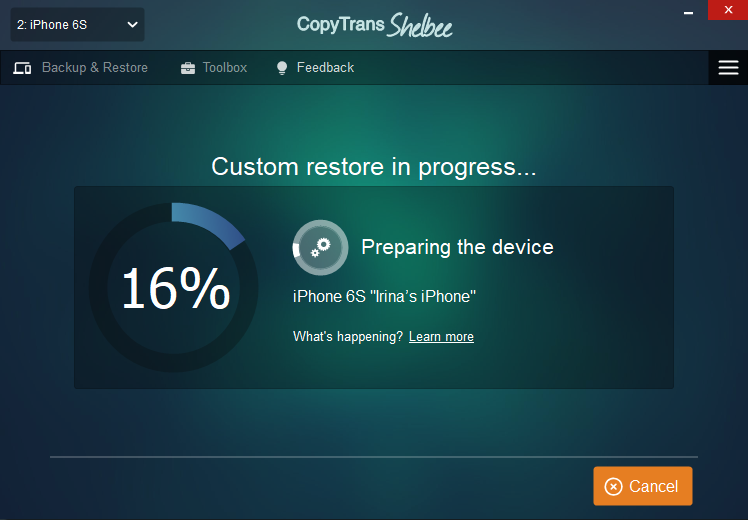 Open CopyTrans Shelbee and connect your iPhone. Click “Custom Restore”. Click the green pencil to select which backup you want to restore your data from. After you’ve chosen the right backup, click “Next”. Wait until the loading process finishes. Select the data you wish to restore. For example, you can restore photos from iPhone backup. Just select “Photos”, then click “Next”. You can also restore iPhone contacts from a backup. The process is the same: select “Contacts”, click “Next”. You can select as many items as you want. Restore calendars, WhatsApp, Notes – all at the same time! Please note that the data you selected will be overwritten. For example, if you want to restore contacts from backup, the contacts on the device you are restoring to will be overwritten with the ones in the backup. 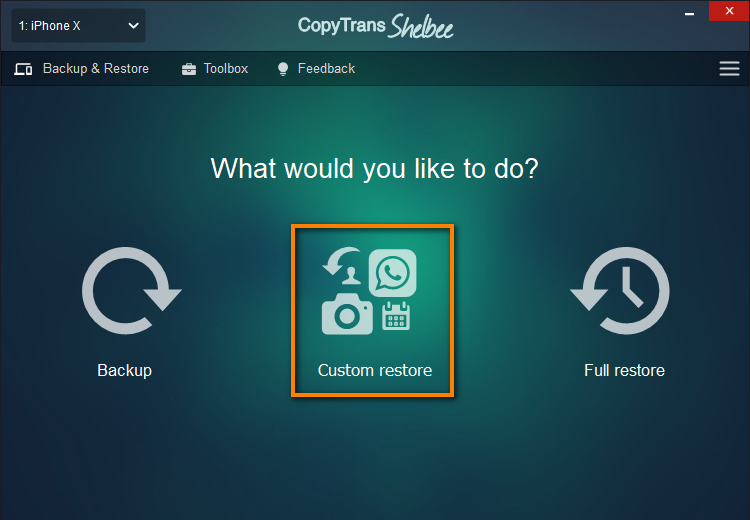 CopyTrans Shelbee will ask you to choose where you want to save the backup of your device in case something goes wrong during Custom restore. Select the destination and click “Start”. Wait until the restore process finishes. That’s it! Your device will now restart.